Born in Baltimore, Maryland, Carol Carpenter is a self-taught painter, specialising in abstract expressionism. A graduate of Antioch University with a dual major in Psychology and Art, she spent her early adult years working as a research associate in psychiatric settings at the National Institute of Mental Health, the Albert Einstein College of Medicine and the University of Maryland School of Medicine. She also married, raised a family, created a catering business, taught painting at a community college and finally made art a priority. 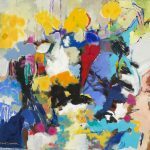 While her paintings often tackle familiar subject matter such as landscapes and floral elaborations, her rich colours set her depictions apart, approaching a Modern Expressionistic style. She utilizes her intuition and experimental processes mixed with a saturated palette to create vivid and energetic works. 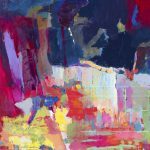 Oil, acrylic, watercolour and ink are her preferred mediums, with which she produces nonfigurative layers of paint beneath the final image which provides a new perspective, inspiration and vision in creating a unique way to view the outside world. 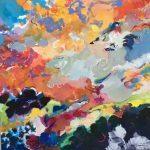 She is “inspired by the ever-changing elements and beauty in nature” and says, “I use colour as my primary focus to transmit energy, meaning and emotion in my art.” About her work, Carpenter says, “creating works of art is a compelling life force. It encompasses passion, spontaneity, intellect and self-discovery. My art is not politically sensitive or culturally eye-opening. 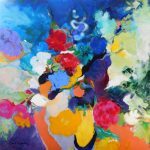 It is simply meant to appeal to the senses and heighten the human experience.” She has exhibited her art in galleries and museums across the United States and Europe, and continues to work with local art organisations, such as the Baltimore Watercolor Society and the Maryland Federation of Arts. Her paintings are included in private and institutional collections.